Following significant pressure, US President Donald Trump signed an Executive Order on June 20, 2018 ending the practice of separating families. However, parents will still be prosecuted and families will remain together in immigrant detention as their cases are being processed, raising significant concerns regarding indefinite detention. It is also unclear when and how families that have already been separated will be reunited. Human rights organizations and journalists have accused private prison operators CoreCivic and GEO Group and govt. contractors Comprehensive Health Services Inc., Dynamic Service Solutions, Dynamic Educational Systems, General Dynamics and MVM of financially profiting from family separation and detention. An online resource by Corrections Accountability Project, "Immigrant detention: An American business" also alleges that bank and investor financing for CoreCivic & GEO Group supports these two companies to profit from the Trump Administration's harsh immigration policies. The Business & Human Rights Resource Centre invited these companies, banks and investors to respond. Responses from BlackRock, BNP Paribas, CoreCivic, GEO Group, Comprehensive Health Services Inc, General Dynamics, MVM, Vanguard and Wells Fargo are available below. Bank of America, Dynamic Service Solutions, Dynamic Educational Systems and US Bank did not respond. JPMorgan Chase and SunTrust declined to respond. While there has been some inaccurate speculation regarding our company’s involvement in immigration and border enforcement policies and the separation of families, GEO in fact has no involvement, and has never had any involvement, in any way with the policies in question. Our company does not and has never managed facilities that house unaccompanied minors nor has our company ever provided transportation or any other services for that purpose. Furthermore, GEO does not take a position on nor have we ever advocated for or against immigration enforcement or detention policies. Whether prosecuting or not, the Trump administration still has the goal, expressed in the order, of detaining families together indefinitely, until their immigration cases are complete... Trump’s plan is also contingent on finding enough beds to house as many as 19,000 women and children in detention facilities... And wherever they are held under Trump’s plan, someone will still have to perform day-to-day oversight of the families, and transport them around—and do the same for the 2,300 children already separated from their families... All of which may explain why the stock prices of oligopoly private prison companies Geo Group and CoreCivic have been rising ever since the Trump announcement, a pure expression of the sacks of cash awaiting private companies if they contribute to caging immigrant families... Instead of being contracted to manage facilities, Geo Group and CoreCivic want to build and own the facilities themselves. Top executives of both for-profit companies have stressed this desire in investor calls. This not only saves on taxes, it’s far more lucrative than operations management. Estimates from CoreCivic’s financial disclosures show they earn 71 percent more revenue per prisoner in owned and managed facilities than in ones they solely manage—and six times more profit per prisoner... Trump’s new executive order signals the administration’s desire for far more immigrant detention construction. 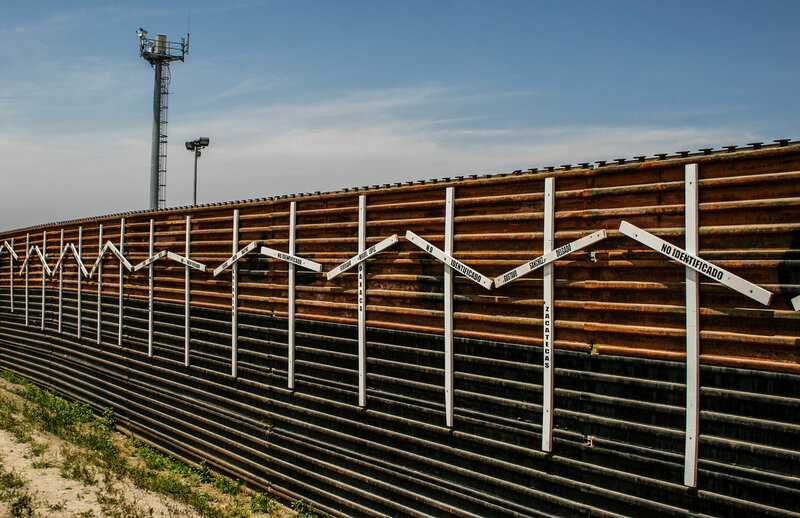 This is already in play; Geo Group is completing work on a 1,000-bed facility in Conroe, Texas, under a 2017 contract with ICE. Separating refugee and immigrant children from their parents isn’t just an emotionally wrenching policy. It’s an enterprise that is benefitting intelligence and defense contractors. Those contractors—including one with a history of scandals—have advertised a flurry of jobs in recent weeks to support the infrastructure surrounding undocumented children whom the Trump administration has taken from their families... One of them... [is] MVM Inc... Federal Contracting databases show MVM was awarded a contract worth up to $8 million over the next five years. The contract... calls for the company to provide assistance in emergency shelter operations for unaccompanied children and extends through September 2022... MVM also has contracts with Immigration and Customs Enforcement for transporting unaccompanied undocumented children around McAllen. According to a contractor database, the work has earned MVM nearly $43 million since last September. ... Joe Arabit, the director of MVM’s homeland security and public safety division, [said] "MVM, Inc.’s top priority is the welfare of children while they are in our care. We are a trusted partner of ICE... and ORR because of the respect and dedication with which we treat those whom we transport. Managing the transportation, security, and shelter needs of these children is a highly sensitive matter, and the safety of those in our care is the most important thing."... The company has been contracted with ICE for its transportation services for unaccompanied immigrant children since 2014, Arabit said, and for ORR’s “temporary shelter services for unaccompanied children since 2017.”... The defense contracting giant General Dynamics'... jobs for ORR involve policy analysis; tracking “new placements and progress of minors in ORR funded care”; supporting ORR’s director in, among other tasks, “review[ing] files and redact[ing] information as directed.”... General Dynamics was the third largest federal contractor by dollar amount, with $15 billion in government contracts in fiscal 2017. According to Gordon’s database, it’s faced $280.3 million in penalties for 23 misconduct cases since 1995... “It looks right now that the Trump administration’s policies regarding immigration is proving to be a relatively lucrative area for private contractors,” said Neil Gordon, an investigator with the Project on Government Oversight. MVM has tremendous empathy for the families and children arriving at the U.S. border. We have made clear that we stand ready to assist the government in any reunification efforts. There has been a misperception of the role MVM is playing on the issue of unaccompanied immigrant children. The current services MVM provides consist of transporting undocumented families and unaccompanied children to Department of Health and Human Services designated facilities – we have not and currently do not operate shelters or any other type of housing for minors. While these children and families are in our care, our priority is ensuring they are safe and treated with dignity and compassion... In 2017, prior to the recent separation policy, MVM was one of several organizations awarded a contract to provide as-needed emergency support services to the Office of Refugee Resettlement (ORR)... To date we have not performed any emergency support services for ORR nor do we anticipate providing any services in the near future. At the direction of the company’s leadership, we have removed job postings related to readiness operations under the separation policy. This is a response from the following companies: MVM, Inc.
General Dynamics Information Technology has provided support to unaccompanied minors through its work with the Office of Refugee Resettlement (ORR), a part of the Department of Health and Human Services, since 2000. This includes casework support services to help ensure special needs of unaccompanied children are met, including medical requirements, and to facilitate family reunification, only after children are under the care of Health and Human Services. General Dynamics Information Technology has no role in the family separation policy, nor a role in the construction or operation of detention facilities. General Dynamics is one of the largest defense contractors in the country... It is also caring for the detained migrant children that the US government has separated from their parents... Since 2000, it has worked for the Department of Health and Human Services’ Office of Refugee Resettlement. This entails “casework support services to help ensure special needs of unaccompanied children are met, including medical requirements, and to facilitate family reunification, only after children are under the care of Health and Human Services” according to a statement provided by General Dynamics Information Technology spokesperson Jay Hauck... With so many new children in the system, General Dynamic has begun advertising for jobs to help process all of the tiny prisoners...These very specific help-wanted ads have attracted notice from reporters and from activist groups Sleeping Giant and Grab Your Wallet, who have begun contacting the General Dynamics and another contractor,MVM, Inc. to let them “know how they feel about making money on locking children in cages.” MVM is a privately-held former CIA contractor with a checkered history that works with ORR to manage emergency shelters... In 2017, General Dynamics made more than $4 billion on IT contracts like these.